Beginning March 23, 2019 and continuing throughout the year, children and their favorite adults are invited to pull out their magnifying glasses and sleuthing hats and come down to the Hallie Ford Museum of Art to participate in The Hunt is On 2019. Each spring we introduce a new family guide that provides clues to find and learn more about the amazing artworks in our permanent collections. 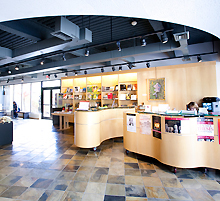 Pick up your clues at our front desk and use your knowledge of art to find specific artworks throughout the galleries. Win a prize once you complete your hunt! From the ancient to the modern, adventure and fun are around every corner. “The Hunt” is included with museum admission and students 17 and under and children receive free admission. Financial Support for "The Hunt Is On" has been provided by proceeds from the "ABC: An Alphabet Book from the Hallie Ford Museum of Art." 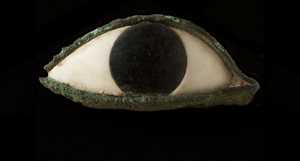 Eye from a mask or statue, New Kingdom, Dynasty 18-20, ca. 1539-1075 BCE, Alabaster, basalt, and bronze; .75" x 2", Gift of Mark and Janeth Sponenburgh Gallery, Hallie Ford Museum of Art, SPG90. Phillip John Charette (b. 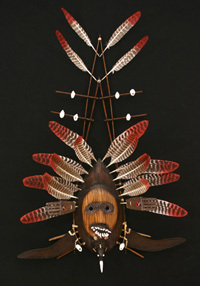 1962) Seabird Yua, 2006, Mixed Media: Ceramic, Wood, Feathers; 51" x 33" x 12", purchased through the Spirit Mountain Community Fund, Hallie Ford Museum of Art, 2006.042.